After thirty-seven chemo infusions in one year and an autologous stem cell transplant, I couldn’t remember what “normal” felt like and I had another year of targeted chemo to go. It was really hard to tell how quickly I was recovering from treatment each time I had an infusion. All I could do was compare how I felt each day with how I’d felt the day or two days before. And it bugged me that I couldn't track my progress. Do I have more energy this week than last week? Last month? What helps me recover? What slows me down? So I started sending myself a text message every morning at 10 AM with a link to a survey of questions about how I'm doing. The graph below is a snapshot of my progress over the past six months (follow the green and blue lines - I'm trending up! Awesome!). In this graph, the red dot in September shows my last (hopefully last ever) chemo infusion and the pink star shows when I had a bunch of immunizations. Both made me feel terrible for a while after. You can see that it took a couple of days for the chemo to really hit me and make me tired, hence the dip leading into early October and that the immunizations made me feel crappy right away. You can also see that I have now recovered to a point where I'm basically at a "normal" energy level (at least compared to when I was in chemo). The survey data has been very helpful for monitoring symptoms, treatment side effects and for giving myself a reality-check when my mind goes down a deep dark hole and I freak out that I have relapsed. Key Hodgkin’s-related symptoms in my case are skin rashes and night sweats. Every day, the survey asks me if I had night sweats last night and if so, how severe on a scale of 1 to 10. It also asks me if I had any skin issues. That way, I can’t lie to myself if I am experiencing real Hodgkin's symptoms. On the flip side, I can calm myself down when get scared about out about relapsing. I have cold, hard data showing that I haven’t had a night sweat or skin rash in months, so when I go to a dark place, I can quickly show myself why I am wrong. Just look at the Night Sweats graph below. I had a couple of isolated night sweats last fall, but nothing since. I can also identify trends and see how different variables affect others. How does sleep affect my energy level? My psychological wellbeing? Apparently a lot . . . just look at the graphs below. My energy level and my psychological wellbeing both tend to surge when I get enough sleep and plummet when I don't. 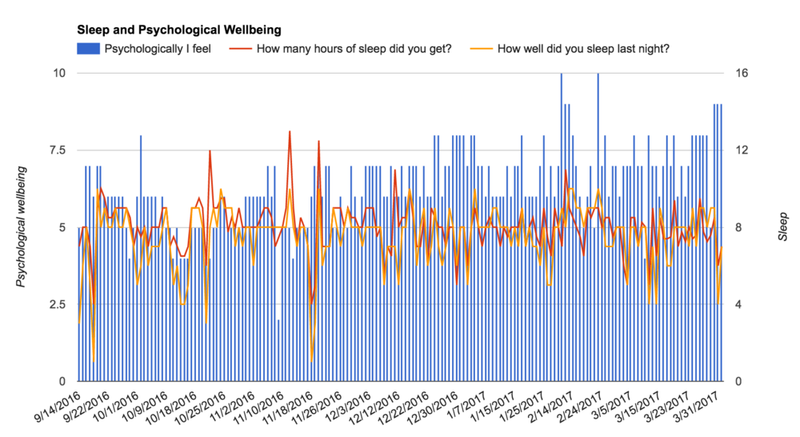 This has been incredibly valuable data for measuring my progress and wellbeing during and after treatment and I highly recommend that you do the same. It gives me peace of mind and shows that the hard work I've been doing to recover is truly paying off and I think it can do the same for you. The gallery below is a step-by-step guide to help you set up the survey for yourself and get it sent to you in a text every day. You should customize the survey to track things that are important to measure during your recovery like energy level, sleep, exercise, symptoms, sources of stress etc. (whatever you think is important to track). Full disclosure, this isn't the easiest thing to set up and it may take 20-30 minutes to do so. Give it a try and see how you do. If you can't figure it out or you'd like us to do it for you, please fill out the form below. If enough people show interest, we will try to figure out a way to do this for you. Keep up the good work! I want help setting this up! Sign up for a Zapier account. Click the "Make a Zap" button. Step 5: Choose "Every Day"
Step 7: Choose "Fetch and Continue"
Step 9: Choose "SMS by Zapier"
Step 10: Choose "Send SMS"
Zapier will text you a verification code. Put it in and you should be good to go! Step 12: Hit "Save and Continue"
Type the text message you want to receive every day. Make sure that you include the link to the survey. This is where you get the link to the survey. Step 15: Test it out! You will get a text message from Zapier when you test it out. Make sure that the link to the survey works. Step 16: Turn on your Zap! Turn on your Zap and you'll get the text with the survey every day! Step 16: See the results! You'll need to save the results to a google sheet. Click on the "responses" tab and select "Create a new spreadsheet". You'll be able to see your results here and create charts and graphs. That's it! I know this seems complicated, so if it is too much for your to do on your own, please fill out the form and we will do our best to help you!